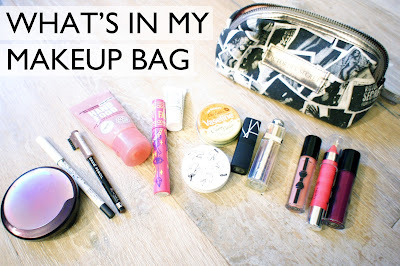 What's In My Everyday Makeup Bag? I have always been curious to know what other girls carry in their makeup bags. I guess it's because the things we carry in them are our bare essentials - the products we can't live without. I go through the products in the video but I also wanted to do a separate blog post for those of you who prefer reading blog posts rather than watching me babble on. So my pouch is from Victoria's Secret which I got from LA a couple of years ago. It's really sturdy, spacious and holds everything nicely. It's also extremely light since it's made of fabric so it makes it easy to carry around. First off, I have to carry mascara in my bag. Sometimes I leave the house without it (on the days where I can't be bothered), so by keeping it in my purse I can also add some extra volume to my lashes when I need to. The one I have here is the original Fairydrops Mascara. I'm not a huge fan of this and just want to finish it off and get rid of it asap. The NARS lipstick in Jungle Red is one of my favorite bright red lipsticks. It makes me look a lot more awake, although not a huge fan of the formula, the colour is incredible. I keep it on the go with me so that when I look dead tired, I can always wake myself up with a tint of red. The second lipstick I have in my makeup bag is the Dior Addict lipstick in 'Duchesse'. This is a recent addition to my collection (as well as the makeup bag) and I am deeply in love with the colour and formula of this! It is exclusively sold at Harrods and is a limited edition lipstick. Dior Addict lipsticks are generally very sheer, but the colour is buildable. They are surprisingly very hydrating for the lips, perfect for on-the-go. For handy purposes, I keep a Victoria's Secret Glossy Tint Lip Sheen in there since it's very easy to apply. The texture is super soft and acts as a tinted lip in with a beautiful fuschia colour, 'Manic Pink'. This is also a new addition to my makeup bag as I only recently repurchased this from Korea. I ran out of my old one a while back and was dying to get my hands on this again. This is great for my dry skin as it doesn't make my skin flaky. It comes with a powder puff so blot away any excess oils. I have to some sort of sample-sized lotion on-the-go with me as my skin, as mentioned previously, can get very dry, especially during the Winter season. This is just one of my saviours for when my skin starts to flake, however I don't think I will purchase the full size. I also have the 'Too Cool for School Dinoplatz Tinted Lip Balm' in Spilled Wine. This berry colour looks intimidating in the pot but actually acts as a hydrating stain on the lips to give it a boost of colour. Smells like grapes as well! A MUST-HAVE wherever I go, this baby never leaves my side. Very awesome for its affordable price, smells incredible and leaves my hands feeling so smooth. I hate that icky feeling when your hands start to feel dry so I always have to keep this with me at all times. It just leaves your skin feeling buttery smooth and I have repurchased this again and again. This product surprised me as I was not keen on using drugstore products a while back. This began to change my mind about drugstore products, however Etude House had a better pencil for my everyday makeup routine, so I tossed this in my makeup bag in case of any touchups that I needed. Part of the Guilty Passions set, this mini lip gloss is great to carry around with you. The texture as I probably need not mention, is amazing, as are all cremesheen glasses. The colour is a beautiful berry red that makes your complexion stand out. Eyeliner is a must have in my makeup bag as it is essential for my eyes to be lined in black whenever I'm out. This stays on for the entire day, does not budge and very black. I will be repurchasing this when I go to Korea in a couple of weeks time. I like to have a range of lip colours with me in case I feel like switching colours after a meal or a drink. This nudey pink lipstick is very girly yet subtle. Also from the Guilty Passions lipgloss set. Last but not least another bare essential that I have in my makeup bag is my lip balm. This lip balm smells divine and moisturizes my lips really well. I'm sad I didn't get more of these as I prefer these to the Pink Bubbly lip balms. One thing I left out from this post is the Maybelline Dream Lumi-Touch Highlighting Concealer. It's very easy to apply when you're on-the-go and is a great dupe for the YSL Touche Eclat. And that's all that's in my makeup bag! Let me know what is your must-have to carry around with you in your makeup bag :) I would love to know! Please like the video if you enjoyed it, and subscribe to my channel if you'd like! More blog posts to come!